Photo via Angel Shave Club website. 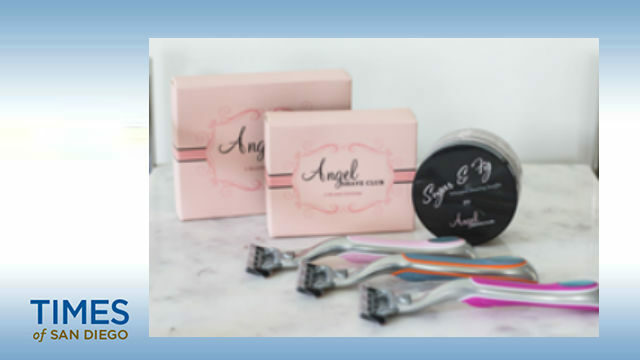 Angel Shave Club, the first boutique shave club for women designed by a woman, is slated to appear on ABC’s Shark Tank Sunday at 9 p.m. According to its CEO and founder, Iskra Tsenkova, a San Diego resident, she made her way to Los Angeles last summer to pitch her company to a panel of investors. Tsenkova was Christmas shopping with her husband when she learned that her business was chosen to appear on the show. She screamed for her husband in the dressing room, who rushed out in a panic and they both began crying and laughing in celebration of such an over-whelming and joyful moment. The monthly subscription shave club, which caters exclusively to women, was generated from a realization Tsenkova had while showering and comparing her razor to her husband’s. After she saw there was no difference between the two blades, aside from a higher price tag, the Bulgarian-born entrepreneur felt a calling to provide women with an affordable, convenient solution to their shaving needs. In the quintessential spirit of pursuing the American Dream, Angel Shave Club was born. In addition to building the company from the ground up, Tsenkova continues her mission of empowering women by donating a portion of all sales from Angel Shave Club to help the fight for gender equality and provide products, education, and jobs to girls and women in need across the globe. To watch Angel Shave Club’s debut on Shark Tank, tune into your local ABC channel Sunday, Jan. 20 at 9 p.m. PST. For additional information please visit.